Well, yes, we’re chasing the news a bit here. Paul Manafort may be a bad egg, but what has he got to do with world peace, you ask? Well, for a start, he is an arms dealer among his many talents. Specifically, he connected French Prime Minister Edouard Balladur with his long-term friend and contact, Lebanese businessman and arms dealer Abdul Rahman Al Assir, helping to broker a complex kickback arrangement as part of the sale of French submarines to Pakistan, with some of the bribes being funneled back to France to fund Balladur’s Presidential election campaign—and $200,000 of the proceeds going to Manafort himself. Zairean kleptokratic dictator Mobutu Sese Seko, who stole billions of dollars from Zaire/ Democratic Republic of Congo over decades of misrule, until finally overthrown in a 1997 rebellion. Somalian dictator and warlord Mohammed Siad Barre, whose violent reign ended in 1991 in fighting that saw the collapse of the Somali state. Among the worst of the worst, Angolan warlord Jonas Savimbi, leader of UNITA, whose bloody 27-year long rebellion against the Communist Angolan government (not much better, to be honest) saw the deaths of hundreds of thousands of civilians. UNITA engaged in widespread massacres of civilians and large-scale recruitment of child soldiers. Manafort’s efforts to promote their cause in Washington in the 1980s helped secure them $34 million worth of arms secretly channeled to them by the CIA. Against this roll-call of mass-killers, torturers and kleptocrats, Manafort’s second most famous client, the one that’s got him in trouble, looks relatively tame: former Ukrainian pro-Russian President Viktor Yanukovich, for whom Manafort lobbied from 2006 up to his overthrow in 2014. Yanukovich certainly ran up a body count during the protests leading to his downfall, and was massively corrupt, but doesn’t approach the bloody reigns of terror of Manafort’s previous clients. Perhaps he was mellowing in his old age. The fact that Manafort failed to register as a foreign agent in the US while representing Yanukovich and his Party of Regions, and, allegedly, made numerous false statements and laundered millions of dollars through real estate deals to cover this up, is what lies at the heart of the charges against him and his associate Richard Gates. 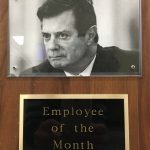 Manafort acted as a lobbyist and a political consultant for his clients, with a particular gift for negotiating the Washington political labyrinth; more generally, he comes across as the ultimate fixer, the guy who knows just who to talk to, who to put in touch with whom, which palms to grease. Manafort is emblematic of everything that is wrong with the world. He is part of what oils the wheels that keep the machine of global corruption, conflict and oppression grinding forward. Oh, and of course he helped get Trump elected. Still, in looking back over the list of Manafort’s worst clients: Mobutu, Barre, Abacha, Marcos, Savimbi, Yanukovich, we can note one other thing in common: they all came to bad ends.